Warning the state government that the Punjab farmer is faced with a major crisis, Balbir Singh Rajewal, president of the Bharatiya Kisan Union, Rajewal (BKU), has said wheat yield in Punjab has fallen by at least 5 or 7 quintals per acre this season. Veteran Congress leader Umrao Singh (82) passed away at Oxford Hospital here today. A Padma Bhushan recipient, former minister and former MP, Umrao Singh had been suffering from various diseases since long. The Congress is all set to attack the SAD-BJP ties terming it an “unholy” alliance. The Congress will distribute copies of the speech of Lal Krishan Advani delivered in the Rajya Sabha in the wake of White Paper of Operation Bluestar in 1984. Dr Joginder Dayal, national executive member of the CPI, today criticised Prime Minister Manmohan Singh for his remarks that Left parties had been on the “wrong side of history”. He said the Left parties were always against the imperialism and imperialistic stand taken by governments. When electors in Punjab go to the polls next month to elect 13 members of the 15th Lok Sabha, they will miss four of the star performers of the previous elections, all from the ruling SAD-BJP alliance, but will decide the political future of three of the sitting MLAs. When I met Umrao Singh in December last year at the wedding of his niece with son of Sangrur MLA Kewal Dhillon here in Chandigarh, he was his usual self. Alert to latest developments, both in politics and sports. Fear of shortage of storage space and gunny bags haunts farmers as wheat crop has started reaching gradually various grain markets of the Malwa belt of Punjab. Harvesting is yet to pick up as farmers are waiting for their crop to dry following last week’s repeated downpour. The problem of non-procurement of wheat by government procurement agencies on account of more moisture content in the crop has been compelling farmers and arhtiyas to block traffic in various parts of the district for the past some days. To bail Afghanistan out of its food crisis, India will send 2.5 lakh tonnes of wheat from Punjab. 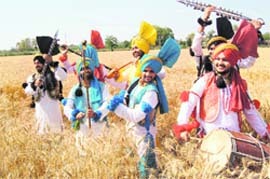 Punjab wheat is being sent to Afghanistan by India for the first time via land route through Attari and Pakistan. Chief Minister Parkash Singh Badal said today that the relief announced by the state government for farmers hit by bad weather was at least 250 per cent more than paid in the Congress regime of Capt Amarinder Singh. Dr Jaspal Singh, vice-chancellor of Punjabi University, Patiala, advocates the promotion of language teaching in Punjab in view of the continued neglect of languages and basic sciences. Numbers of students offering languages and social sciences in undergraduate and postgraduate courses have been witnessing a sharp decline during the past few yeas. Representatives of the Jallianwala Bagh Bachao Action Committee will meet officials of the Ministry of Cultural Affairs to work out the beautification plan for the Bagh, said Governor of Bihar RL Bhatia here yesterday. Due to lack of proper shelter, 15 Punjab Armed Police (PAP) cops guarding Chief Minister Parkash Singh Badal’s private residence here have been camping in the cremation ground for two years. Reacting to the death of a farmer of Kajjal Majra village in Fathegarh Sahib, allegedly due to his inability to sell his low quality yield, Rajewal said here today that the government should take immediate steps to help farmers before more helpless farmers lost hope. He alleged that the state government had not understood the extent of damage caused to the wheat crop due to inclement weather. “The compensation rates for damaged crops were fixed ages ago and have not been revised. The state should declare this damage a result of natural calamity and give relief to farmers accordingly,” he said. The state would register only 100 metric lakh tonnes of yield this year. “Last year the yield was 157 lakh tonnes and the target for this year was 155 lakh tonnes. The procurement last year was 105 lakh tonnes and this time it was expected to cross 115 lakh tonnes. But, now the procurement will not go beyond 70 lakh tonnes,” he said, adding that farmers in the state had suffered a loss of at least Rs 840 crore. Rajewal said the wheat crop had been adversely affected due to high temperatures in the second week of March. “Fungus and yellow rust spread through the crops causing widespread damage. Neither the Agriculture Department, nor scientists of PAU, Ludhiana, bothered to warn the farmers against it.” “Not just the quantity, the quality of the grain is also not up to procurement specifications and the farmer is in for a double whammy,” said Rajewal. Mandis across the state are also flooded with the grain with high moisture content as farmers were using combine harvesters. “Once the moisture content reduces to 12 to 14 per cent, this wheat will be procured,” assured an officer of the Food and Civil Supplies Department. Till Saturday, over 5,71,769 tonnes of wheat had been procured by the state agencies and the FCI for the central pool while private players procured 2,349 tonnes of wheat. Last year till this date, the central pool procurement was only 9,989 tonnes. “I am a worker president whose job is to take everybody along,” says Lal Singh, new working president of the Punjab Pradesh Congress Committee (PPCC), describing Congress chief Sonia Gandhi as an epitome of sacrifice and his role model. “I am honoured to be a Congress worker. Born in a poor farmer family, I joined the Congress as a worker 47 years ago and voted in the 1972 elections of Giani Zail Singh as President of the PPCC. Though the Congress had many presidents, working presidents and acting presidents, I am a worker president,” he said immediately after taking over the reins of the faction-ridden Punjab unit of the party. He is the second president of the committee after leader of the Congress Legislature Party and Leader of Opposition in the Punjab Vidhan Sabha Rajinder Kaur Bhattal had to resign from the post last year under one-person-one-office rule of the party. Lal Singh has been made working president as Mohinder Singh Kaypee is contesting the Jalandhar seat. The high command is yet to decide on a regular president of the Punjab unit. He recalled those days when he, as a Congress worker, moved from village to village on his bicycle pasting posters and organising political rallies. He claims he has been a disciplined soldier of the Congress and has always remained loyal to his leader. Describing the Congress as a secular and peace-loving party, he says his immediate task will be to seek an immediate end to “jungle raj” prevailing in the state ever since the SAD-BJP government assumed office. There has been no development in the state and people are feeling frustrated with the “Badals private limited company”. “If the Congress is like an ocean, Badals’ Akali Dal is like a stinking cesspool. It is why more and more people are keen to join the Congress,” he commented. He also clarified that all inductions in the party by Capt Amarinder Singh in the recent months were done with the consent of Kaypee. The biggest grouse of the people of Punjab has been an acute scarcity of power. Whatever claims the government is making, none of the proposed thermal plants would be commissioned during the present tenure of the government. “The Congress is united. If there is any worker who is unhappy or is nursing a grouse against the party, I will personally go to him or her and bring him back in the party fold,” he says, holding that he has always enjoyed confidence and proximity of the presidents as well as Congress Chief Ministers of Punjab during his five terms as MLA. “The party could not have rewarded me more than giving me ticket for seven assembly elections and now honoured me with the office of the president. Whether I stay president for a day or some weeks or years, it does not matter,” he says. Umrao Singh is survived by wife Surinder Kaur, his grandson Ramanjeet Singh and three daughters. Expressing grief over his death, Prime Minister Manmohan Singh not only called up his wife but also faxed a condolence message to her. The Prime Minister stated Sardar Umrao Singh was a dear friend and a valued colleague. His passing away is a great personal loss for him and he will always be remembered for his fine human qualities and his commitment to the cause of uplift of the poor and the underprivileged. Umrao Singh was cremated at the crematorium of his ancestral village of Wadala on the Nakodar road. His grandson Ramanjeet Singh lit the pyre. Local Bodies Minister Manoranjan Kalia, PPCC president Mohinder Singh Kaypee, former ministers Avtar Henry, Jagjit Singh, Santokh Singh, MLAs Kewal Dhillon, Sarabjeet Singh Makkar, KD Bhandari and SAD leader Kuldeep Singh Wadala attended the cremation besides other leaders. CWC member Iqbal Singh, CLP leader Rajinder Kaur Bhattal and a PPCC secretary Virendra Sharma also expressed shock over his demise. Having elected five times to the Punjab assembly and the Lok Sabha in 1993, he remained Education, Rural Development and Sports Minister from 1972 to 1977 when Giani Zail Singh was the Chief Minister. He has been the Revenue Minister from 1992 to 1993 in the Beant Singh regime. As the president of the Athletic Federation of India, he was honoured with Padma Bhushan in 1983 for his contribution in holding Asian Games in Delhi in 1982. Chandigarh: Deputy Chief Minister Sukhbir Badal expressed grief over the demise of Umrao Singh. In a condolence message, Sukhbir recalled the contributions of Umrao Singh, especially in the development of sports, and his commitment to the uplift of the downtrodden. He expressed sympathies with the bereaved family. To the surprise of the gathering, Umrao Singh was cremated without any state honours. No guard of honour was presented to him. PPCC president Mohinder Singh Kaypee said they had asked the Deputy Commissioner to make arrangements for his cremation with state honours as he was a Padma Bhushan recipient, former minister and former MP. DC Ajit Singh Pannu said there was no provision for a former minister’s cremation with state honours. At the same time, he said he was present during the cremation and laid a wreath on his body. Meanwhile, Local Bodies Minister Manoranjan Kalia said Umrao Singh should have been cremated with state honours, but it could not be done due to some lapse, which was unintentional. Kalia said the Deputy Commissioner should have taken permission on the phone from the Chief Secretary for cremating Umrao Singh with state honours. Bholath MLA and Congress spokesperson Sukhpal Singh, said copies of the speech translated in Punjabi, would be circulated among people to show the real face of Advani and unholy and anti-Panthic pact with SAD patron and Chief Minister Parkash Singh Badal. Badal is working to help a man become the PM who hailed Operation Bluestar and wished it had happened earlier in 1982, said Khaira. “Unless the SGPC or the Akali Dal or others enable us to remove criminals from the gurdwara, we shall have to take action. This has never been issue in the past. In the days of Pandit Nehru and Kairon, the police entered the Golden Temple complex and arrested culprits and offenders from inside the temple. It was never an issue, but you made it one by repeatedly maintaining this,” Khaira read from the speech said to be delivered on July 24,1984. Khaira said Advani had blamed military action on three parties. He says, “In Punjab there are three guilty parties: the extremists led by Bhindranwale, the Akali Dal and the government. The only difference between this White Paper and the statements of PC Sethi (then Home Minister) was that they only attacked the Akalis, not even Bhindranwale. This omission was conspicuous. For the first time after Bhindranwale is dead, there is criticism of Bhindranwale and his terrorist activities”. Advani adds, “I and my party hold the Akali Dal guilty. I hold it guilty as co-accused. I wont spare them. Some of my colleagues in the Opposition may be inclined to say the Akali Dal is not at fault and it is the government that is. I will never say that. After all, they have been with me in the government. I know that during those three years they were with me, they never raised any of these issues. Therefore, when they raised it, I criticised and attacked them. I won’t spare them,” Khaira quotes from the speech. Addressing the media here, he said in fact, Dr Singh himself had surrendered before imperialist countries like the US, as it appeared from his statements that he would have resigned had the Indo-US nuclear deal not been through. Dr Dayal said Dr Singh and LK Advani should forget about becoming Prime Minister as the Left Front was fast gaining ground at the grass-roots level. The Left parties had taken up the real issues confronting the common man. He said the UPA and the NDA had withered away with their major allies choosing to go alone in the elections. On the other hand, Left Front’s allies were increasing day by day. Meanwhile, the CPI leader asked the Bahujan Samaj Party (BSP) to withdraw their candidates in favour of the Left Front in four constituencies of Bathinda, Sangrur, Faridkot and Anandpur Sahib. If the BSP failed to do so, then the Left Front was not forced to give unconditional support to it. Dr Dayal said if their party came to power it would review the loan waiver to farmers and would evolve a uniform mechanism for all states. He said the present policy of the central government had not benefited Punjab farmers as the state government had agricultural debt of Rs 50,000 crore while it got only Rs 1,200 crore. It is unusual and unprecedented that more than 30 per cent of sitting MPs are replaced and three candidates who got the mandate of voters of their respective assembly segments just two years ago are opting for a role in national politics. In neighbouring Haryana, only two of the 10 sitting MPs, Kuldip Bishnoi (Bhiwani) and Atma Singh Gill (Sirsa) are not seeking re-election. Within three months of the completion of the general elections, Punjab will witness another political battle for a minimum of two and maximum five assembly byelections, depending upon how many of MLAs contesting the Lok Sabha elections succeed. Byelections of the Nurmahal and Banur assembly segments are certain because of vacancies caused by the death of Gurdip Singh Bhullar and Capt Kanwaljit Singh. Elected legislators from Amritsar West Om Parkash Soni (Congress) is contesting the Amritsar seat, from Kahnuwan Partap Singh Bajwa (Congress) has been fielded from Gurdaspur, and from Jalalabad Sher Singh Ghubaiya (SAD) is in the fray for the Ferozepur seat in the Lok Sabha elections. Whosoever succeeds will vacate his assembly seat. And in all probability, all these byelections will be held on the basis of their jurisdictions before delimitation. Among those not seeking a fresh mandate is the president of the SAD Sukhbir Badal. He, however, has to go to voters by middle of July to get elected to the Punjab assembly to continue as Deputy Chief Minister. Others who have opted out of the race for membership of the Lok Sabha this time are Sharanjit Singh Dhillon and Zora Singh Brar (both from SAD). The fourth Punjab MP not in the run is former president of the Punjab unit of the BJP Avinash Rai Khanna, whose constituency, Hoshiarpur, has been declared reserved after delimitation. Though most of the political parties go by the golden rule of not replacing the sitting MPs, Punjab has been the exception. Sher Singh Ghubaiya, sitting MLA from Jalalabad, has replaced Zora Singh Brar, who represented Ferozepore for three consecutive terms since 1998. Ghubaiya will face Congress heavyweight and two-time MP Jagmeet Brar. Incidentally, Jagmeet Brar represented Faridkot on both previous occasions. In Hoshiarpur, the BJP has put up a bureaucrat, Som Parkash, who sought premature retirement to contest the elections. Sharanjit Singh Dhillon (Ludhiana) has been replaced by Gurcharan Singh Galib, who left the Congress to join the Akali Dal early this year. Galib will face Manish Tewari, a spokesperson for the Congress, who lost the last elections to Dhillon by less than 25,000 votes. Though his prolonged illness had made him immobile, he used to remain in touch over the phone, be it the issue of a delay in holding of National Games in Ranchi or the expulsion of Capt Amarinder Singh from the Punjab Vidhan Sabha. As an expert in Constitutional Law and Parliamentary practices, he would often react to important political developments, especially legislative ones. Honoured with Padma Bhushan for his outstanding contribution in a smooth conduct of the 1982 Asian Games in New Delhi, Umrao Singh not only remained a member of the Punjab Assembly for five terms but also had a stint in Rajya Sabha after he lost two consecutive Lok Sabha elections in 1996 and 1998. A lawyer by profession, Umrao Singh was first elected to the Punjab Vidhan Sabha from Nakodar in 1960. He had not only defeated Beant Singh in 1960 but also the Marxist supermo Harkishen Singh Surjeet from Barapind in 1969. His last election to the Punjab assembly was in 1992 from Nakodar. That was his third term. He represented Barapind twice in the assembly. Another important feature of Umrao Singh unknown to many Congress men was his association with the SAD. Umrao Singh was not only a general secretary of the Akali Dal in 1955, but also a member of the SGPC from 1954 to 1959. He later joined the Congress. What could describe his active lifestyle more than his lifelong association with athletics, his first love that continued till his death? He was in his second term as president of the Athletic Federation of India. Umrao Singh was an excellent hockey player and an ardent follower of our once national game. He died on a day when the Indian team won Azlan Shah Hockey Cup in Ipoh in Malaysia after 14 years. He had the longest association with both the Punjab Amateur Athletic Association as well as the Punjab Olympic Association. He also remained vice-president of the Indian Olympic Association. Umrao Singh was not only a versatile all-rounder but also a politician of substance who handled various portfolios, including revenue, education, sports and parliamentary affairs with perfection. Whatever grain has reached the mandis has heavy moisture content as a result of which the Food Corporation of India (FCI), Markfed and other agencies have refused to procure it. Most of the wheat that has arrived in the mandis has moisture content of around 14 per cent, whereas procurement of 12 per cent moist grain is permissible. An official of the FCI at the grain market at Badal village said only 832 bags of wheat had been procured during the past four days. The wheat that arrived on Saturday had more than 13.5 per cent moisture content. Surjeet Singh, arhitiya, said the FCI had this time been assigned the task of procurement here. He feared that lifting of grain might be delayed as the godowns of the FCI were already overflowing with the previous crop. He said against the requirement of more than 1.40 lakh bags for packing wheat, only 30,000 jute bags had so far been allocated to this particular market. A lot more bags would be required as it was a bumper crop this time. He said media reports of shortage of storage space had created anxiety among farmers. The farmers point out that the grain might get damaged in polythene bags that the government was planning to acquire to meet the demand because of the ongoing strike by employees of the Jute Corporation of India that manufactures jute bags. 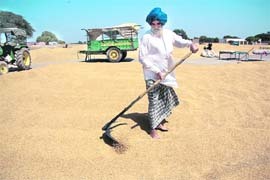 Jagsir Singh, an official of the market committee at Kudda village, said the arrival of grain was expected to pick up by the end of next week. About 2,500 quintals of wheat has so far arrived in the grain market, but Markfed that has been allocated the task of procurement has yet to step in. Not a single bag of wheat has yet arrived in the grain market at Kalcharani, the ancestral village of Chief Minister Parkash Singh Badal. Today Sangrur and Sulargharat village (near Dirba) witnessed blockade of traffic by farmers on main roads for hours together. At Sangrur, farmers blocked the main road outside the new grain market for about 2 hours in protest against the non-purchase of their wheat crop by officials of procurement agencies on the plea that there was more moisture content in their crop as compared to the moisture content fixed by the government. They lifted the blockade when Additional Deputy Commissioner (ADC) Arshdeep Singh Thind, along with other officers, visited the site and held talks with them. The ADC said for the procurement of wheat of every farmer, a four-member committee had been formed. In the committee there would be an inspector of the procurement agency concerned, an arhtiya, a farmer and a representative of the local market committee. After holding talks with representatives of the farmers and arhtiyas, the matter had been sorted out. He also said in case more moisture content was found in any heap of wheat, its auction would be held after drying the same. At Sulargharat village, farmers and arhtiyas also blocked traffic for about 3 hours on the Sangrur-Delhi national highway in protest against the non-procurement of wheat by government agencies. They lifted the blockade when the Deputy Commissioner visited the blockade site and held talks with the protesters, with regard to procurement of their wheat crop. It was to be ascertained that the Pakistan government will allow the movement of Indian foodgrains to Afghanistan, but India, it was learnt, had planned to send the relief via Pakistan provided Pakistan allowed it. Sources said the Punjab Civil Supplies Department was ready to reserve wheat stock for Afghanistan, where people were said to be starving in certain areas. India, particularly Prime Minister Manmohan Singh, has cordial relations with Afghanistan, its President Hamid Karzai and people. India has had traditional ties with Afghanistan and the two have history of bilateral trade practices. “We are ready with 2.5 lakh tonnes of wheat and awaiting instructions of the government of India. Food and Civil Supplies Department. Grewal confirmed having received a letter from the FCI for the movement of 2.5 lakh tonnes of wheat stock last week. Punjab has wheat stock exceeding 50 lakh tonnes and parting with 2.5 lakh tonnes would not be problem for the state, particularly as the Department of Food and Civil Supplies was getting ready for new crop. Referring to the previous Congress government of Amarinder, Badal said it had spent only Rs 81 crore as relief in five years, but the SAD-BJP government disbursed more than Rs 187 crore as relief in two years. Badal said Punjab was the only state which went beyond UPA government norms of payment of relief to farmers. He said the norms permitted maximum compensation of Rs 2,000 per acre, whereas Punjab government raised it to Rs 5,000. Dr Jaspal Singh, vice-chancellor of Punjabi University, Patiala, advocates the promotion of language teaching in Punjab in view of the continued neglect of languages and basic sciences. Numbers of students offering languages and social sciences in undergraduate and postgraduate courses have been witnessing a sharp decline during the past few years. In an interview with The Tribune, the vice-chancellor, who is a former envoy and an eminent educationist, suggested that professional colleges across the state should introduce the teaching of one language or other for their students. Colleges of management and technology could introduce one subject of social sciences. The educationist, who has a long experience of teaching in Delhi University, said of now the teaching of languages and social sciences was getting limited to government colleges and universities only. The falling number of students opting for these subjects had made these courses financially unviable. Private colleges had been offering job-oriented courses and technical courses since these were money-spinners and offered good returns. Dr Jaspal Singh underlined that the study of languages and social sciences broadened the horizon of knowledge of students and also played a key role in the personality development of a student. This was being compromised in the present educational scenario, he said. He opined that the languages were losing their charm since these courses did not offer much job opportunities. If professional colleges introduced language teachings a compulsory subject, this would create a lot of job opportunities and would attract more students at the postgraduate level. When asked if the teaching of an additional subject would not be resisted by students in professional colleges, Dr Jaspal Singh said the introduction of one additional subject could initially face opposition from students, but educationists and scholars agreed that this would ultimately help produce better scholars and professionals. He said universities had to look up to the government for grants, as these were not commercial-run institutions. He lamented that society had to change its mindset, as most of the parents were not willing to pay an annual fee of a few thousands rupees at the time of admission of their wards in a university, while willing parents shelled out a hefty annual fee at the time of admission in professional private colleges. This was decided following a meeting between the managing committee of the Jallianwala Bagh Memorial Trust, headed by Bhatia and leaders of the Action Committee, here. Dharminder Patra of the Punjab Students Union (PSU) said Bhatia assured the Punjab government would be requested to quash the case against Gurmukh Singh Maan, PSU president, registered on February 12. The managing committee of the Trust decided to dismantle the recently constructed open-air stage to hold light-and-sound show in the Bagh. The shows will be held on the ground. However, its script, which is available in the 52-minute-long CD, will be allowed to be read by representatives of the action committee. It also agreed to restore the historic well to its original form. While all 94 bullet marks on various walls of the Bagh will be preserved with glass. It also allowed entry in the Bagh in groups for paying tributes to martyrs. The Rs 5-crore beautification plan for the Bagh was prepared following a meeting of the Board of trustees had held under the chairmanship of Prime Minister Manmohan Singh. 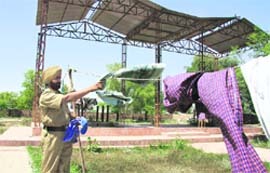 However, the beautification project hit road block when members of the Shaheed Bhagat Singh Naujawan Sabha and the Punjab Students Federation, protesting against alleged change in its original structure, had tried to dismantle the open-air stage on February 12. The cops, including a sub-inspector, are here from Jalandhar to take charge of the outer security when Badal became Chief Minister in 2007. Since then they have been living in the cremation ground belonging to the Badal clan. On a visit to the place on Saturday, this correspondent saw two cops cooking meals in the cremation ground where they sleep at night. One of them said back home they felt ashamed of telling relatives about having been made to camp in the cremation ground. Part of the cremation ground is reserved for Muslims to bury their dead. The cops said they also face the problem of drinking water as the water from the hand pump was not potable. They bathe and dry clothes next to the platform meant for cremation. These cops have round-the-clock duty of manning the barricades on the roads leading to Badal’s residence.